Nov. 17, 2014, 12:38 p.m.
Footnotes and floating drones: The magazine is working on putting a little more pizzazz into its feature stories’ presentation online. By Simon Owens @simonowens Nov. 17, 2014, 12:38 p.m. In a recent long New York magazine interview with Jon Stewart, the Daily Show host made an offhand reference to a man named Conrad Murray, whom many likely recognized as the doctor who was convicted of manslaughter for prescribing the pills to Michael Jackson that eventually led to the singer’s death. But if you’re like me, you either never knew the name or had long ago forgotten it, and you would have either needed to open a new browser tab to Google him — or, more likely, just kept reading the interview without getting the reference. 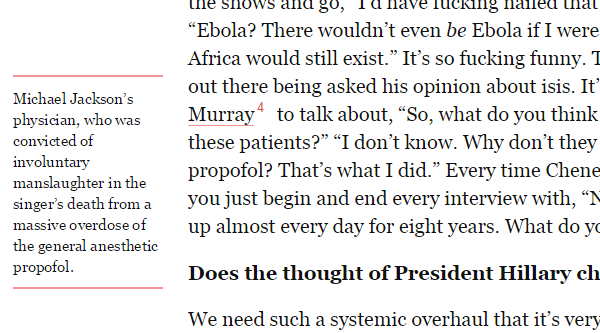 But on this particular article, I noticed a red line under Murray’s name, and when I hovered over it a box popped up on the side of the page informing me of his significance. In a media world focused the phrase “explanatory journalism,” I found this feature to be a simple yet elegant way of providing contextual information without disrupting the flow of reading. It seemed particularly well suited for this kind of Q&A, where the journalist can’t pause every few moments to explain something that Stewart just said. Each week, Williams and his designers choose one of the feature articles set to appear in the print magazine, usually the cover story, and brainstorm ways they can add visual design elements that improve the storytelling process. This has become increasingly common at many publications ever since the launch of Snow Fall, the multimedia story project produced by a team of New York Times journalists, designers, videographers, and coders — though when I mentioned Snow Fall, Williams was quick to note that New York’s forays into the medium are much less epic in scale. “It’s possible to build them with each issue and without overwhelming the team,” he said in a phone interview. New York began to experiment with designs outside the normal scope of its content management system with the publication of a long feature story on former baseball player Derek Jeter. The story centered on Jeter giving access to a photographer to document his daily life, so it lent itself to a wider display of photographs, rather than confining the images to the much narrower section allocated for text. The team then moved beyond just crisper images in October when the magazine published a story on the rise of drones. In addition to sprinkling drone-filmed videos throughout the piece, it also utilized animated gifs of cartoons hovering next to the story copy as you scrolled down. So what’s the editorial process like for such a project? “Once we know what’s going to be in each issue, which might be a week before it goes to press, we’ll pick a story, and often it’s the cover. It’s usually the story that will be most impactful and a lot of people will read.” For stories where they want to add footnotes, the editor who works on the story and the writer who did the interview will make the decisions on which elements need to be explained more. I asked Williams whether his team planned on building some of these tools into the CMS so they could be used more widely, but he said there were no current plans of doing so. He said such multimedia offerings can become distractions from the main text of a piece if used indiscriminately. POSTED Nov. 17, 2014, 12:38 p.m.
Owens, Simon. "It’s small touches that can make a difference in New York’s layouts." Nieman Journalism Lab. Nieman Foundation for Journalism at Harvard, 17 Nov. 2014. Web. 25 Apr. 2019. Owens, Simon. "It’s small touches that can make a difference in New York’s layouts." Nieman Journalism Lab. Last modified November 17, 2014. Accessed April 25, 2019. https://www.niemanlab.org/2014/11/its-small-touches-that-can-make-a-difference-in-new-yorks-layouts/.